Louis Poulsen has collaborated with visionary architects and designers to produce innovative lighting solutions for buildings and their surroundings for more than seventy years. The superior styling, craftsmanship and quality of Louis Poulsen products can be found on prominent projects around the globe. Together with designer Poul Henningsen, Louis Poulsen created a lighting and product philosophy summed up in the words function, comfort and ambience. Louis Poulsen's approach to lighting lies in a very strict and uncompromising product philosophy grounded in simplicity. There must be no elements which do not serve a light related purpose. This results in products with a very simple and discreet design, ideally suited to all types of architecture, both new and old, across cultural styles. 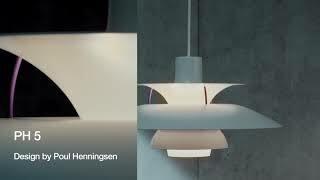 Louis Poulsen's PH5,Artichoke, AJ, and PJ products are Design Classics.